OK, don't freak out. I am not throwing my shovels to the curb! I love gardening too much to give it up. In fact, I would love to make it a full time job sometime in the future. However, I always seem to reach a breaking point in gardening. I don't know if I am alone in this, but I reach a point when I am just done with gardening for the season. It always seems to be about the time when the weather starts growing colder and it's just not as enjoyable to be outside. 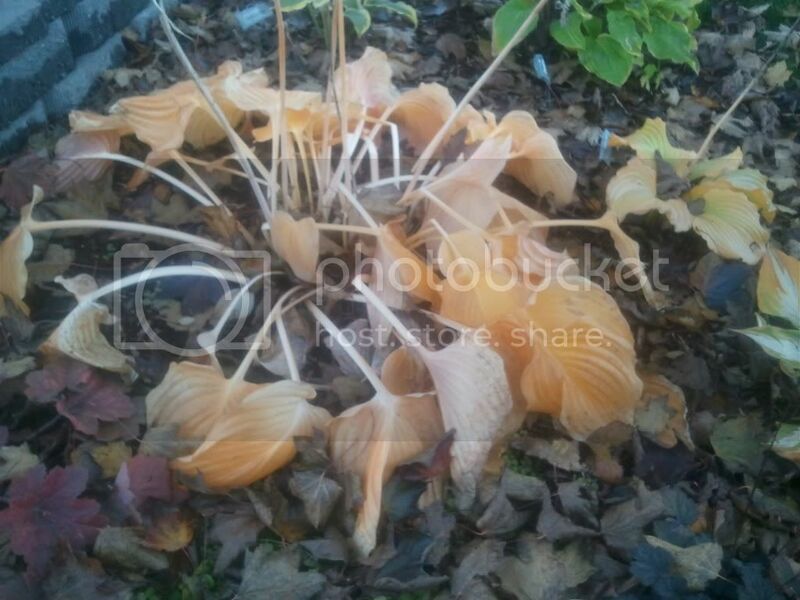 This hosta represents how I feel about gardening by fall. By sometime in January or February I start to get the gardening itch again. I just want to smell hostas, and dig my hand into some fresh dirt. I visit greenhouses just to remember what a live plant looks and smells like again. I wonder if it would be different if I lived in a climate where the weather was nice all year round? Is it the weather change, or the fact that during the summer I just throw everything I have into garden that I burn myself out? Am I a bad gardener? Or are the others out there that feel gardening burn out? Okay...let me answer that....I also burn out around now....BUT...now's the time we're supposed to be planting things into the ground but after the extreme summer months, I'm worn out....BUT I don't get a break....so I've learned to relax a little and go crazy in February and March. What's nice about Wisconsin is that you can shut down....but you have to shovel all that stupid snow....my oak trees are about to drop all their acorns....and I'm NOT looking forward to that right now! Yeah...I have those cycles as well:) So enjoy the break coming up:) from mowing lawns and watering flower beds. PS. I get to come home for Christmas!! I'm really excited....tickets were super cheap which was unexpected....so I'll get to visit Wisconsin again. I miss it so much during this time of year. I get burned out also. It's that time of the year. It's time to scrapbook for me. Then when the seed catalogs start coming in, I just the gardening bug again and start wintersowing. You're normal! digit temps. I truly believe you could fry hamburgers on the pavement.Point is I wanted a warmer climate. Getting older and the infamous Wisconsin winters were taking its toll. After living in LV Nevada I miss the distinct change and beauty of seasons in the Midwest. Here every day is basically the same and I know I could never adapt to desert life or gardening. So I'm planning to move back eastward, maybe the southeast this time. I miss gardening, the soil, the variety of plant life, the scent in Spring--- everything. This has been a wonderful experience. The weather most of the year is beautiful. The skies and mountains are breathtaking but I'm a gardener who enjoys the wonderful abundance that I frew up with and had in the Midwest. I respect desert gardeners. It's a tough place where water evaporation and dehydration makes it very difficult. I will miss the weather but can't wait to get back to green living!